The AT&T Wireless national DM program started with a regional test mailing. At the time direct marketing was handled by multiple marketing teams on a regional level. Based on test results the sales performance in the SW Region skyrocketed and ROI surpassed all other regions. All direct marketing for the company was eventually consolidated and the SW region marketing team became the national Direct Mail Direct Response (DMDR) team. Achieve aggressive sales goals in internal and external call centers to keep AT&T ahead of the competition. Increase response and conversions while driving down the cost-per-activation. Sales had to be delivered at a low marketing cost, with a solid ROI. Increase customer revenue and reduce churn. Execute a flawless program to support AT&T’s iconic brand. RPM’s founder, Rick Rappe, led the agency team and managed the program strategy and execution of AT&T direct mail programs for over 10 years. During that time, he and his team created over 375 successful programs, developed 5,000 test packages and managed over 1.5 billion pieces of direct response marketing for AT&T. A comprehensive performance-driven system to ensure AT&T would meet daily, weekly and monthly call objectives which would assure achievement of annual sales goals and cost-per-activation targets. Implementation of disciplined ongoing testing strategy, database rotation strategy, creative and offer development, and detailed response and sales analytics to provide continuous cost-per-activation optimization and predictable sales performance. Development of segment-specific programs layered on top of the Core Acquisition program including Small Business; Hispanic Bilingual; Customer Add-a-line; Pre-paid GoPhone; and Drive-to-Retail programs. Due to its rock-solid process and incredible results, the AT&T DM acquisition sales channel grew rapidly to become one of the largest and most successful ongoing acquisition programs in the country, driving in thousands of leads and sales every day. 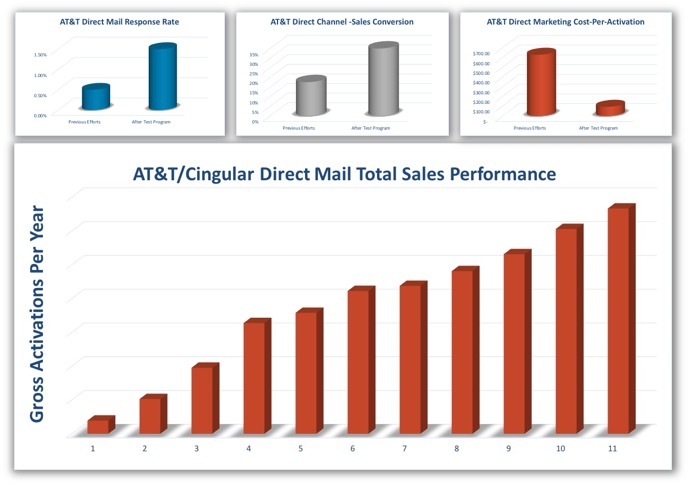 The Direct Mail program was recognized by AT&T leadership as a competitive marketing advantage and was rolled out and scaled up nationally, driving in double-digit revenue growth each year while maintaining excellent cost-per-sale and ROI performance. Because of Rick’s leadership, the program grew dramatically to become responsible for more than 1,500,000 sales per year and more than 20% of AT&T’s total sales.